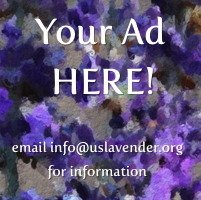 Welcome to The United States Lavender Growers Association! USLGA was formed to support and promote the United States Lavender industry and allows a collective voice for lavender growers and those interested in, or doing business with, lavender in the U.S.
We support lavender farms, connect growers to buyers and provide continual education for both lavender growers and lavender users. We have four categories of membership to choose from and you can sign up online. Learn about membership benefits and the USLGA. If you are already a member, log in to see the member-only resources, as there are many. We are so happy to have you here! Enjoy roaming and learning. View our member directory or search for a member. If you'd like to learn more about the basics of lavender, visit our Lavender 101 information. Don't forget to check out our events page to see what's happening! We are very proud to offer so many resources right here in one place. Be sure to take advantage of the many research articles, newsletter archives, meeting notes, grower information, a member directory, and much more! We always welcome feedback, as we continually strive to be an invaluable asset to our members. Despite some bad weather across the US, we had a fantastic turnout for USLC 2019 in Charleston, South Carolina. Can't wait to start planning USLC 2021!